“We’ll be ready to launch the first GPS III in 2015, but it now appears the next generation GPS Operational Control System, or OCX, won’t be ready for about a year or two after that,” General William L. Shelton, commander of Air Force Space Command told attendees at the 28th Annual National Space Symposium. The first GPS III satellite had been expected to launch sometime in 2014. The slip in the satellite’s launch date, however, is not due to development problems with the spacecraft, according to the program’s primary contractor. Several sources familiar with the program suggested that the launch delay might be due to a shortage of launch capacity. The Air Force did not respond to questions about the delay by press time. Military officials have, however, been anticipating a shortfall of launch capability and studying ways to ease the crunch and keep down escalating costs and effort that could be particularly important to maintaining the capability of the GPS system. The early satellites were launched in rapid succession to fill out the constellation and are now aging — and potentially failing — in rapid succession as well. 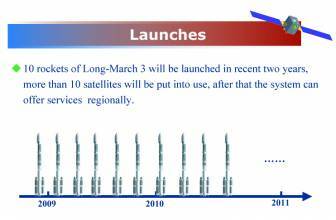 To keep the constellation healthy the military is looking at launching more than one GPS satellite at a time. The Air Force and Industry are also looking at the possibility of expanding the selection of launch vehicles available to place military payloads in orbit. While the delay of the first satellite launch should be a year or less, the slippage on the ground control segment could be as much as two years and has triggered some changes to the way the work is being handled. Completion of the Next Generation Operational Control System or OCX, which was expected to be delivered in 2015, now falls in to 2016 or 2017 time frame — though an expert familiar with the issue, who spoke on condition of anonymity, said that the schedule had some padding for contingencies. The source said that the delay is the result of modifications to the technical baseline of the contract and formal recognition of shifts in the contract’s requirements. Those affordability challenges had led the Air Force to ask Raytheon to find some savings, said the source. After working closely with defense officials the company proposed deferring or deleting some capabilities, including some near-term and some later in the sustainment part of the program, said the source. Although the person declined to cite specific details of the changes, as the modifications was still being weighed by government officials, the source said they would save more than $100 million. Some of those changes, however, would come at the expense of the program’s schedule. That plan includes several new contracts, including two awarded to Raytheon and Lockheed at the beginning of the year. Raytheon won the Launch and Checkout System (LCS) contract that supports the GPS III satellites up to the point of launch. Under LCS the firm “will provide for the early identification and mitigation of any GPS III enterprise risks, support ground checkout and launch operations and resolve any anomalies prior to the first GPS III satellite launch,” said Ray Kolibaba, GPS OCX program manager for Raytheon’s intelligence and information systems business, in a statement in January. Once a GPS III satellite is ready for launch the support function is handed off to Lockheed Martin. Under its new Launch and Checkout Capability (LCC) contract Lockheed will support the actual launches, early orbit operations and checkout of all GPS III satellites before they are turned over to Air Force Space Command for operation. The contract includes trained satellite operators and an operations center at Lockheed Martin’s Newtown, Pennsylvania, facility. The LCC team should be ready for the first scheduled readiness exercise in August, said Friedman. “The two pieces [LCS and LCC] work hand in hand,” said Keoki Jackson, vice-president of Lockheed Martin’s navigation systems mission area. The LCC work, he said, moves the overall ground control capability forward by bringing online some GPS III–specific capabilities before the full OCX system is in place. Lockheed will start with the LCC and then transition at some point in time to full OCX operations, he said. Full OCX operations will encompass the IIF satellites, the IIR and IIRM satellites, and the full on-orbit operational maintenance of the GPS III after the early-orbit checkout. Jackson noted that the Air Force is now also looking at expanding the roll of LCC. Lockheed will likely gain some useful experience for such a downstream mission under a new contract announced May 4. “Under the contract, Lockheed Martin will provide technical support to the Air Force’s 2nd Space Operations Squadron (2SOPS) to monitor the health and performance of the first two GPS III satellites from launch through their 15 year operational design lives,” said Friedman in a statement. The contract will also support the operations of the Launch and Checkout Capability at the company’ Newtown facility. Before the implementation of the Launch and Checkout Capability a lot of the GPS III work would have been done out of Schriever Air Force Base, Colorado, by Air Force personnel, said Jackson. Tapping the facility in Newtown will enable the Air Force to move faster.